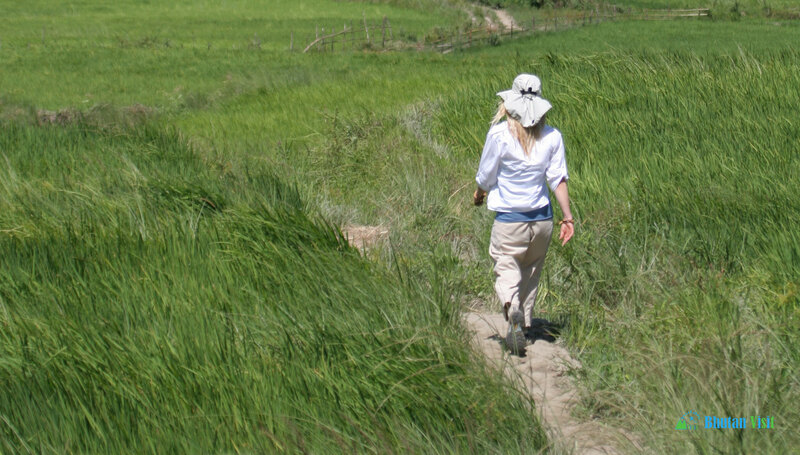 Our Village Walking Tour in Bhutan follows trails that have linked villages for centuries. The best way to experience the people, forests and scenery! Arrive Paro. Transfer to Thimphu. A day of acclimatization in Thimphu (2,400m). After lunch visit the Changgangkha temple, where locals bring their children to receive a blessing and babies are given their names by the lama. Then drive to the takin reserve to see the national animal of Bhutan. From here drive to the viewpoint and take a short hike to Wangditse temple. The route passes a mass of prayer flags and a small farm before descending along a small forest path to reach Wangditse temple (under renovation so not accessible). From here the level path takes you full circle and affords good views of Thimphu dzong. Descend by car to visit the impressive Dzong. Day 2 TANGO HIKE & PICNIC. Today, start early for a short hike to Tango monastery. Drive along country lanes on the way to the trail and then hike uphill for just under one hour before reaching Tango Monastery, one of the most important institutes of Buddhist studies for the monks of Bhutan. A picnic lunch will be served near the riverside before returning to Thimphu. In the afternoon, visit the Folk Heritage Museum andthe Institute for the 13 Traditional Arts (Zorig Chusum). In the early evening visit the Buddha point and take a stroll around the Memorial Chorten, where you will meet people from all walks of life. You will also have some free time for visiting the town centre. You may wish to visit the Post office where you can see the stamp collections and even have your own photo taken and your own stamp made. Day 3 PUNAKHA MOUNTAIN AND VILLAGE DAY-HIKE. Start early and drive towards Punakha.On the way stop at Dochula pass (3,000m) to take in the views of the Himalayan peaks and circumambulate the chorten. A 40 minute downhill hike through rhododendron forests will give you a breath of fresh air before you start on a beautiful two-hour walk through villages and farmland. In the spring you will walk throughsmall villages, skirt green rice terraces and see various exotic trees, plants and birds. In the fall the farmers will be harvesting their rice terraces. You may even see eagles swooping below you deep into the forested valleys. Enjoy a picnic lunch in the fields, near a temple and continue for another 2-hour walk through villages until you reach the road where you will be met by your vehicle. Proceed towards Punakha (1,200m). Punakha Dzong was the old capital of Bhutan and has an imposing temple full of colorful carvings, paintings and enormous statues. Cross the recently restored cantilever bridge to enter the dzong. After visiting the dzong visit the exhibition which details the bridge restoration process. Day 4 PUNAKHA SIGHTSEEING AND TWO SHORT HIKES. Today you will do two short hikes. Start off early in the morning for a short hike to Khamsum Yulley Namgayal stupa for views over the Punatsangchu river. Then drive to visit the Chimi Lhakhang temple, seat of the so called “Divine Madman.”After lunch, set out on a drive towards Talo monastery. The interior of the monastery is not open to tourists but you can visit the courtyard and enjoy the view over the valley. A series of short hikes will take you below the monastery criss-crossing the main road at various intervals and ending with a two-hour downhill hike past a village, a school and through some forested areas, that will lead you back to Punakha dzong.Alternative option: half day of river rafting in the Punatsangchu river (book with us in advance). Day 5 DRIVE TO PHOBJIKHA AND HALF-DAY VALLEY HIKING. Drive along winding Himalayan mountain roads from Punakha via Wangdi to the high glacial valley of Phobjikha (3½ hrs, which is at an altitude of 2,800metres. Here you are likely to see grazing yaks. This valley has some idyllic-looking rural scenery and consists of a central marshland, winter home of the rare black-necked cranes, and farms where potatoes and other high-altitude crops are grown. Take an afternoon hike of 3 hours through the valley, alongside the pristine river, through forests and villages. Alternative option: cycle tour in the valley. Day 6 PHOBJIKHA SIGHTSEEING AND HALF-DAY HIKE. DRIVE TO TRONGSA OR CHUMEY. Visit Gangtey Monastery and the RSPN information centre, to learn more about the black-necked crane. 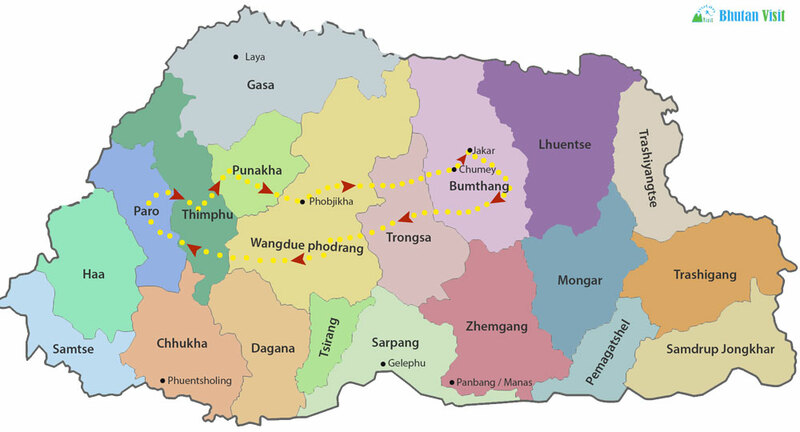 Option 1: Take a 3- 4 hour hike from Phobjikha towards the valley of Sephu and Rukubji. This is a fairly strenuous hike, which starts from above the Gangtey monastery and climbs for about 1½ – 2 hours to the Gyeche-La Pass, (3,580m), following the old routes before the road was built. Visit Kumbu monastery before reaching the pass and then continue downhill into the valley where you will pass through several villages until you eventually meet your vehicle and continue on the journey towards Trongsa. Drive to Trongsa (2hrs). Option 2: A shorter hike: Stop at the viewpoint before reaching Trongsa and take the old path that used to be the main access to Trongsa dzong. Descend sharply to a wooden cantilever bridge and then climb back up towards the dzong’s main entrance. This 1½hour hike will make you realize quite how the dzong dominated the route between the east and west of Bhutan.Visit Trongsa Dzong. Drive to Chumey Village (1½hrs).Be sure to wander around a little to see daily life in a very typical rural village in the Chumey valley. Day 7 DAY HIKE TO THARPALING MONASTERY. Day 8 BUMTHANG SIGHTSEEING (JAKAR). A day of sightseeing in Bumthang. Visit Jakar dzong, Jambay Lhakhang and Kurjey Lhakhang and have lunch in a village farmhouse before setting out on a short village hike to Tamshing monastery. Return towards town, stopping off at Karchu Dratshang where you may get a chance to see the monks debating in the Tibetan style. Visit OgyenCholing Palace Museum, an enormous and ancient building that used to be the home of a local lord and houses a good range of the original accoutrements of daily life. From here take a short hike through the villages of Ogyen Choling, Gamling and Kharab before reaching Namkhar Lhakhang where you will meet the vehicle. Return towards Jakar, stopping at Lake Mebartsho, where the revered treasure revealer, Pema Lingpa retrieved a burning butter lamp from the deep waters. Day 10 RETURN DRIVE TO WANGDI (5 HRS). En route, visit weavers at Zungney village and stop to visit the dzong (if not already visited) and climb the steps to the Trongsa Museum, housed in the beautifully restored watch tower. Day 11 DRIVE TO PARO. Drive from Wangdi to Paro (3⅓hrs). En-route to Paro you can see perched on the hill,Simtokha Dzong, the first dzong built in Bhutan by the Shabdrung. After lunch in Paro town,cross the traditional bridge and visit the impressive Rinpung Dzong, which featured in Bertolucci’s film “Little Buddha.” Descend into Paro town for some free time. Day 12 HIKE TO TAKTSANG, THE “TIGER’S NEST”. Morning hike or horseride to Taktsang temple, also known as the Tiger’s Nest, which is built into the sheer rock face at an altitude of 3,000 metres. This is a highlight of the tour and involves a 2-hour uphill hike. The visit to the temple, and the return downhill to the base makes this a 4-hour round trip.This hike requires a certain level of fitness but is not excessively difficult. In the afternoon drive towards the ruined fortress Drugyel Dzong from where you can get a view of the distant Jhomolhari mountain and enjoy the rural scenery of the valley with its small villages and farms scattered here and there. On the return to town, visit KyichuLakhang, one of the oldest temples in Bhutan. You may wish to book a massage or a hot-stone bath at one of several hotel spas to relax after your busy day.